There is truth in climate change. But don’t blame your friends for burning plastic wares in their back yards, nor yell at kids using spray deodorant. You may also drop any pretension on suspecting your friendly carpenter for patronizing lumber because the wood they are using are trees maintaining climatic balance. All these insinuations and more are all fed to us through misdirection. They constitute hogwash. Now listen to this. There are eight sovereign states (USA, France, Russian Federation, United Kingdom, China, India, Pakistan and Korea) that have successfully detonated nuclear weapons. There are even countries not listed as member of the so called Nuclear Club with nuclear capabilities like Israel and Africa. 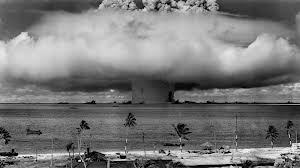 Countries with nuclear weapons are testing, almost detonating at will, their nuclear arsenals by firing in the deep ocean their own versions. The power is awesome that everything within the explosive sphere would shake and rattle down to the site’s foundation, disturbing everything from rock formation to tectonic plates. And these military exercises are not done in a mere isolated instance. It is almost a grand display of awesome military might. It is strengthening their capabilities for purposes of control. And it is conducted almost regularly! When high end or complex bombs are detonated in the ocean, its flooring would crack depressing plates that contribute to earthquakes, tidal wave and tsunamis. The waters would explode and the atmosphere radiated to the extent that the flow of wind, the volume of vapors swept upwards, add to whatever cloud formation there is. This is a birth of storms, greater ones at that. The intensity of the disturbance created is expressed in similar effect on the planet, not only in the deep waters but also on islands in a domino fashion. US, Iran, Korea, China, etc all have nuclear capabilities which have already passed the quality control of their military principals. And every time there is a discovered advantage not only in design but in the destructive property of the bomb, it would surely be tested, either on the ground or in the waters. Well, mostly in the deep waters where spooks would never take note of what is happening. As a consequence of these mighty explosions, done with such regularity, the earth’s position tilted to a certain degree. Note that the constant gravitational pull of the sun and the moon provides climatic formation which the planet would repetitively experience. But when the earth tilts to another direction, there will naturally be changes, climate changes to be exact. Canada and Northern America is experiencing what scientists refer to as winter storm, a normal incident if it is only on the North Pole. On the other end of the globe, Syria is also battered by worst winter storms. In Southeast Asia, especially in Southern Philippines (Mindanao) storms would surprisingly visit the islands, strong ones which natives could not understand since they have never experienced typhoons for an entire stretch of several generations. Yet these climatic conditions are normally a weather occurrence in Northern Philippines, well, except for the greater intensity each tropical depression brings into the affected islands and its inhabitants. In other words, the whole world is experiencing abnormalities in its weather condition. It is precisely because we, well, it’s actually the military establishments of world powers, have added another dimension to natural volcanic eruptions with powerful bombs detonated in various corners of the world. The constant explosions push the earth to tilt and its axis literally bended causing the planet to rotate in another side. One day, the Philippines, a tropical country, may find itself extremely in a spot we call North Pole! Now, that is what climate change is all about. Next time you experience something unusual in your environment, don’t accuse your neighbors. Posted on January 18, 2014, in Uncategorized and tagged Climate change, nuclear capabilities, nuclear weapons. Bookmark the permalink. Leave a comment.